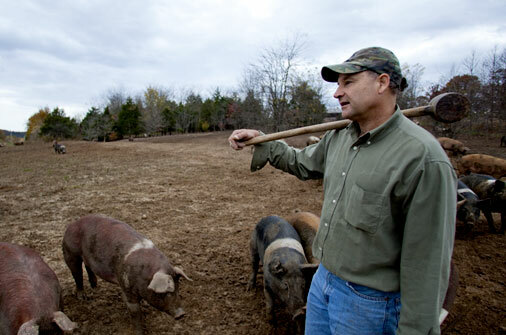 Fifth-generation hog farmer Russ Kremer is a fiercely passionate advocate of sustainable farming. On his 150-acre family farm in the Missouri Ozarks, he raises heirloom-breed pigs, like Berkshire and Tamworth, in open spaces where they're allowed to grow naturally healthy — rooting, nesting and exploring freely without antibiotics, added hormones or growth enhancers. Now, Russ didn't always farm this way. When he graduated from the University of Missouri in the early 1980s, modern hog production was taking root, with Russ right in the middle of it. He gave his animals drugs, raised them in confined quarters and sped them to market, like every farmer he knew. But after a while, he began to question some of the common industry practices. The deal was sealed when one day a boar gored him and he nearly lost his leg — and not because of the wound. Due to the routine feeding of antibiotics and other additives, the boar had developed antibiotic-resistant germs, which were transferred to Russ when he was gored. The ensuing infection festered for months, until an effective treatment was found. That near tragedy changed his life and way of farming forever. Russ threw out the antibiotics, destroyed the confined barns, began mixing his own feed to ensure it was antibiotic-free and traveled to Europe to learn more about the sustainable production methods there. In 2001, Russ helped found a cooperative that now has more than 40 hog farmers who, like him, are committed to doing what's right for the animals and for the land. Their hogs are raised humanely and are prized by chefs from coast to coast for their tender, flavorful meat. And Russ continues to advocate for sustainable hog production with his fellow farmers and anyone else interested in creating a more sustainable food system. Farmers are a critical link for how food gets to our plate — we honor and respect their work, recognizing that they play a unique role in our food system. They are some of the hardest working folks we know, rising before the sun and adjusting their work pattern according to the weather — no easy feat when we think about climatic variations! We aspire to build strong relationships with our farmers — getting to know who they are, what matters to them, and therefore why this matters to the food that we make. We want to strengthen the connection between farmer and consumer. We aspire to build strong relationships with our farmers — getting to know who they are and what matters to them.